So, with St.Patrick's Day around the corner I was looking through my nail polish collection searching for a green. Green is one of my favorite colors. Most of my home is green, but the same can not be said for my polish stash. I only had a few to choose from... only 1 full sized that I chose on its very own, Revlon Matte Suede in Emerald City. 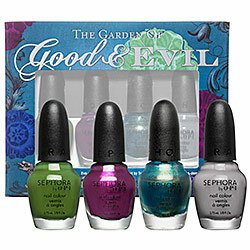 The rest are from Sephora's mini collections, Read my Palm from Havana Nights, Caught with my Khakis Down from Safari Luxe, and this little gem Completely Fern-ished from The Garden of Good & Evil. While Revlon's Emerald City may be a more appropriate green for St. Patty's Day, I was drawn in by Completely Fern-ished. I have had this mini set since the Fall and I have tried and loved Tempted by Teal, Eve-y on the Eyes (bought the full size) and Frankly, I don't give A-dam (bought the full size of this one too) but I was a little afraid of Completely Fern-ished. I mean really, the color is strange. But, now I'm in love! Completely Fern-ished was the only polish in this collection that was exclusive to this mini set. Its really a shame because I would love a full sized bottle! Anyone know a good dupe? Sephora desrcibes it as Dark Green (thanks Sephora) but I would say its a mid toned green. My favorite thing about this polish is that it changes so much depending on the lighting! In these two photos right & left it appears darker than in the photos below. In some light it actually looks quite dark and almost like a hunter green, but in most light it looks much more yellow toned and lighter. As for the formula, I was nervous for a minute there! The first coat was really thin and streaky! I applied 3 coats total, but I think 2 would have been ok if I applied a heavier first coat. I wasn't expecting such a thin polish from Sephora by OPI so the first coat was very thin. I don't think my poor photos show off how glossy this polish is (especially the photo left, I wanted to show you how light green the polish can look) I am enjoying wearing a super glossy creamy color with absolutely no shimmer. Were you ever afraid of a nail color only to find yourself completely in love? As you can see not the greatest and not the worst. I do wear a base coat but I do not wear a top coat and I am really hard on my hands. Dark colors show the wear on the tips worse than light colors, so I forgive the wear on the tips. But, I was disappointed that I got my first chip on day 2. By day 5, there were several chips on the top corners that you can't really see because of the curve in my nail. Thanks for checking out my blog! I'm now a follower of yours as well :) What are the best "Sephora like" beauty sores in the UK? I am traveling to London in 2 weeks and I'm very excited to explore the beauty scene! this is a very interesting green. looks really cool though.